Madonna’s latest movie W.E. has quite a big promo behind it, including lots of interviews and videos reports. Andrea Riseborough and James D’Arcy sat down with omg! and asked what is was to work on W.E. and what it was like to work for Madonna. Madonna’s work ethic is second to none. There was so much passion starting at the top it was impossible not to feel that infection. She was as prepared and as professional as anyone I’ve ever worked with. Just a couple of hours before he joined Madonna and Andrea Riseborough at the taping of “The Graham Norton Show” on Wednesday January 11th 2012, star of W.E. James D’Arcy was a guest on live UK breakfast show “Lorraine”. In his interview with Lorraine Kelly, James talked at length about what it was like working under the direction of Madonna! It was the last day of shooting and D’Arcy was still sporting a dyed blond hairdo. Come the cry of “that’s a wrap” there was no waiting around for a hairdresser to transform D’Arcy before his next gig, playing a buzz cut prison officer in the British drama, Screwed. Madonna attacked me with a pair of scissors and cut it off herself. The man who would one day decide he wouldn’t be king after all liked to play the bagpipes at Balmoral, so D’Arcy was sent off to learn. On being told it could take him a year rather than the six weeks allocated, he emailed Madonna. Would it be OK if he just did enough to look as though he could play? The reply came back: just because someone says you can’t doesn’t mean you have to listen to them. Duly challenged, he and his tutor had a go. After six weeks he managed three minutes of convincing piping. It did somehow sum up how it was with working with Madonna.There was no space for the word no. At the end of it there’s an amazing feeling of accomplishment that you did something you truly didn’t think you could do. You get over it in 10 seconds. There is just no time on a film set to be in awe. She’s not big on small talk, Madonna. We talked about the work we were doing. We did have a laugh while we were going along but we weren’t chatting about the other part of her life. It obviously exists but we weren’t focused on it, we were focused on trying to shoot four pages that day. It was the first time I had really seen her as ‘Madonna Madonna’. There were a few paps around when we were making the film but it wasn’t like we were under siege. But at the film festival it was pretty wild. When we came off the red carpet one of the women who worked for the film festival said ‘George Clooney was here last night. He got about a quarter of that’. Having Madonna as a director was inevitably going to attract attention. As soon as the project was announced, indeed, there was a sense of critics waiting to pounce. I wonder if that concerned him initially. When I spoke to her on Skype I thought it was going to be a five-minute phone call. It was an hour. I was blown away by how incredibly prepared she was. I don’t know quite why I might have expected something different, maybe it was because I did have some residual feeling of her milieu as a singer and dancer and songwriter. She compares very favourably with almost every director I’ve ever worked with. That made me totally turn this around in my head and think wait a minute, this woman is a filmmaker. Madonna is courageous in that she constantly reinvents herself. I admire that in a human being, not to just do the same thing for the next 30 years. When I went to meet Madonna, we had a cup of tea together and her passion for the story was infectious. She’s read every publication about Wallis and I think she understands her in a very specific way – in relation to her own life. Wallis was an American divorcee, twice-over, and the British public were up in arms. Madonna needed to tell this story. I had the great fortune to wear the most extraordinary costumes in W.E. – Dior, Vionnet, Cartier. I also got to wear replicas of the Cartier jewels Edward gave Wallis. Whoever finds them will see the inscription – Wallis and Edward – and probably try to sell them on eBay and trigger a news story. The repercussions of what might happen are funny but I felt awful, really bad at the time. Stars Andrea Riseborough and James D’Arcy talk to Digital Spy about Madonna’s new movie W.E…. She was totally prepared. Every single day. Utterly passionate and a real support. She’s totally intuitive in the way that every time you knew that you could take her hand and she would lead you in the right direction in terms of tone and where we were in the landscape of the piece. This was the longest period time [I’ve ever covered.] I was 26 to 70. So you’ve got to keep a handle on that and Madonna always had the instinct of where exactly we should be. Madonna had seen me as Margaret Thatcher in The Long Walk To Finchley. She’d seen that and a couple of other films I’d done and when I went to meet her I wanted to know what fuelled her passion for the story. And meeting her, it was totally infectious. She was so ignited with wanting to uncover what Wallis and Edward’s lives might have been. It was artistically such a fulfilling experience. If I wanted to paralyse myself with fear I could’ve sat back and gone, ‘Oh, now, this is going to be a big leap. This from this.’ But I was not going from that to that. In between playing Rose in Brighton Rock and playing Wallis in W.E. I was on Broadway doing a play called The Pride. If you allow yourself to be paralysed by fear you paint yourself into a corner, artistically. Having someone being interested in you and wanting to meet you, that’s exciting. We met, we got on and when that happens in a matter of days you just dive into the abyss and you are immersed. The future character is living vicariously through Wallis Simpson and because of that the film is not a regular biopic. I liked the fact Wallis and Wally had their own relationship in the abstract. Whatever the critics’ opinion of the piece as a whole, few can deny the film sheds much light on an often unjustly maligned woman. We all cling on to what we think we know, but the fact was that Stanley Baldwin [the Conservative Prime Minister] created a fantastically successful propaganda campaign around Wallis and Edward, but especially Wallis. Two weeks before the abdication, Baldwin released to the press pictures of this Baltimore divorcee who wanted to steal the king. There she was clad in head-to-toe haute couture and she was wearing British jewels – the monarchy’s jewels, given to her by Edward – so of course people weren’t going to like that. The king was a man of the people – the working man admired him – and they had no idea why he was being taken from them by this ruthless divorcee, which was nonsense. They’d been together for a long time and it had been covered in the inter-national press but here there had been a press embargo. Had the subjects gone on this trip with him, like the rest of the world, then they too would have thought this was the most romantic thing in the world. The disappointment was aimed at Edward; the anger was aimed at Wallis. We had a wonderful relationship and I have every respect for her. She’s incredible, a tour de force in herself. She’s inspiring. My relationship with her as my director – that’s where the interesting relationship lies. It is intimate. Anything before that doesn’t matter, really, because until you work with someone, until you know someone, you have no capacity of knowing what that person is. I think she is an amazing woman. What made you decide to work on W.E.? I’ve been working with Madonna for 14 years as her stylist on all her own projects and for many years I’ve been talking to her about directing a film. She told me about [W.E.] when she started writing with Alek Keshishian a couple of years before we shot. It was obviously a very interesting story and super exciting for costumes. It’s a huge project costume-wise given all the different eras, social classes, and periods the film covers – were do you start on such a big task? You always start with the script – it’s your template. You break everything down. And [you have] a series of meeting with the director – in this case, Madonna – and you figure out the tone and the point of view of the story you want to tell. There’s a practical side to a script breakdown when you figure out how many people are in the story and how many changes they have. How hands-on was Madonna with the costume side of the film? She’s like any director would be – working in film is 100% collaborative and the great thing about working with Madonna is she really allows people to do their job. She was very hands-on because she was interested. No one understand the function and the power of costumes like she does, having worn them for 25 yrs as an entertainer and an actress. She was hands-on in terms of being interested but she certainly didn’t micromanage. Did you have to make a lot of the clothing or were there a lot of vintage pieces? It depends on the character but around a third of the costumes were made [by us], a third were rented from costume shops and a third we bought from vintage dealers. We didn’t have any original clothes owned by the Duke and Duchess – those belong to museums. Were there any iconic looks you were absolutely determined to recreate? We recreated some Elsa Schiaparelli looks – she’s a famous couturier from the 30s – and we worked with the fashion house Vionnet which existed in the 30s. We had Christian Dior recreate four looks for us and Cartier recreate some jewellery. It was very important we had that authenticity. When you’re doing a movie based on real people and events it’s very important you do the research but at a certain point you have to figure out what’s going to be the most cinematically compelling. The jewellery that Cartier created are copies of original pieces that are privately owned. Just like a great painting, if there are reproductions out there it devalues the original so they protect their work and their art very closely. Once the film is finally released all over the world it’s true, Cartier will destroy the ten pieces they recreated for the film. It’s very sad for us but we understand. It’s to protect the integrity of the originals. Was fashion more important than usual to this story? I think the Duke and Duchess of Windsor were so known for their style – their look and how they dressed – that it was a very important part of telling this story. How different was it working with Madonna on the film to, say, a concert tour? Well, I wasn’t dressing Madonna, I was dressing the actors so that was different. Everything else wasn’t that different. We have a creative language – an aesthetic understanding – and we kind of have a short hand. She’s the ideas person behind all her performances so she’s been giving direction for years. She’s a natural director and she’s really good at it – better than most film directors I’ve worked with. Is there anyone else on your costume design wishlist? There are a lot of people whose work I admire but it really always comes down to the story. It doesn’t matter how great the actor or the director. I really have to connect with the story. What’s Madonna like as a director? She and I have this creative language together because I’ve been working with her for the past 14 years. I loved having her on the other side of the camera and being able to collaborate with her in that way. It wasn’t that different because she’s an idea person and she’s always directed me anyway, in terms of everything we’ve done from album covers to photoshoots to the play in the West End so we’ve worked in so many different disciplines and we have a real fluency in language so I feel like she’s been directing me for years! The only difference is that it’s more objective with her behind the camera, she has a real sense of an incredible aesthetic, the only other experience I’ve had like this was working with Tom Ford on A Single Man, most directors don’t know how to discuss the nuances of the fabric, colour and the silhouette, and the beauty of working with Tom and working with Madonna was the vernacular. How involved were you on set? Were you constantly tweaking and fiddling with details? It’s different than a photo-shoot when it’s all about a tableau and perfection of detail. The thing about creating costumes is that the work is really done in the preparation and the research, and the fitting and I really believe once you create that costume and it’s been fit and agreed upon in all its glory. My job as a costume designer is to be there the first time the costume is worn in front of the camera and to commit it to continuity but what the actor does – if the actor chooses to role his sleeves up or his shirt, or in Andrea’s case, fold her dress up so she can dance – is really up to the actor. It’s not about getting in the way of their characterisation, it’s my job to help facilitate their work as actors and to give them something to work with as that character. It takes on its own life. Actors really understand costumes and their inclinations for what to do with their costumes is really the beauty of the collaboration. 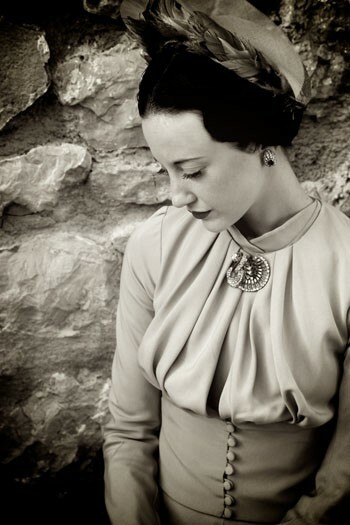 Were there any style rules of Wallis Simpson that you had to abide by? We adored the Cartier cross bracelet that Edward famously gave her, how did you recreate that? When Madonna told me she wanted to work on the film and that she was working on writing the film, the first thing I thought of was the jewellery and how important it was going to be to portray it. Famously, the relationship between jewellery and the Duke and Duchess of Windsor was legendary so I said to Madonna, that’s going to be the biggest hurdle. Luckily, early on, we contacted Cartier and we recreated 10 iconic pieces that actually belonged to the Duke and Duchess of Windsor. The cross bracelet was at the centre point of their relationship! Van Cleef and Artel as well as Cartier made the vintage museum archive available to us so we were able to use beautiful pieces that they have in their collection that aren’t even for sale but are just part of the museum exhibition of their jewellery. Everything had to be scheduled ahead of time as a lot of the vintage jewellery from Cartier came from Switzerland or Paris. What designers did you collaborate with for ‘W.E’? 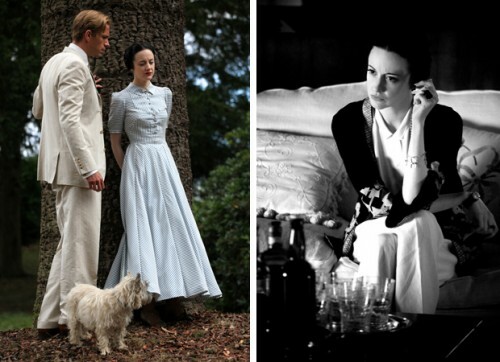 I only collaborated with two fashion designers for the movie and that was only for Andrea Riseborough’s costumes. Andrea had 60 costume changes as Wallis. In the end, Vionnet made four dresses for us and Christian Dior made four as well. We used three of the Dior outfits in the film. I thought Dior was really important for the film’s authenticity and homage as Wallis was one of the very first Christian Dior clients and was also a client of Madeleine Vionnet so they were very important to include in the film and I didn’t want to attempt to recreate a Dior dress so thought it’d be more appropriate for Christian Dior to recreate a Dior dress. We went to them with some research and asked them to recreate the looks that she’d worn and they had evidence of in their archive and it was wonderful, I feel like fashion is a character in the film and it was so important to portray what Wallis and Edward really wore. In terms of presentation and the image that they put forth to the world, the world of luxury, couture, tailoring and fine jewellery on an independent budget was quite challenging so the collaborations benefitted us in so many ways. It gave us the authenticity of the relationship Wallis would have had with Christian Dior and they with Wallis Simpson and it also gave us beautiful quality for the film. I also used a lot of vintage and designed a lot of pieces for myself. We worked closely with Dunhill for all the tailoring for the Duke of Windsor’s outfits. They’re an English company and understand the Savile Row tailoring and actually gave us our own tailor from Savile Row who worked specifically on James’ costumes and we were able to recreate how Edward dressed and what he wore. It was just an incredible process. There’s a beautiful scene where Wallis and Edward are on a yacht, how did you go about choosing those sunglasses for Andrea? I think we tried a few on to see what suited Andrea’s face but those are some vintage sunglasses that I found at a costume house in London and I thought they were beautiful. I used a lot of blue for the character and these had a wonderful blue tone. After all, they famously named a colour after her, called Duchess Blue, as Wallis Simpson famously wore a lot of blue. Has Madonna’s personal style been influenced by the W.E vibe at all? She’s always really loved the fashion of the 20s and 30s, she wore a beautiful dress that was made for her specifically by the House of Vionnet for the Venice Film Festival [above] that has a very 30s feel to it. How did you vary what Wallis wore based on where she was? She had a wardrobe for London and a wardrobe for the South of France. They were very different. Her wardrobe in London was always very finished and she wore furs, hats and heavy fabrics while in the south of France – in the scene where Edward’s been abdicated and she fled to the South of France to take refuge from the press – it’s much more at home, it’s casual and intimate. Her clothes become lighter with lighter colours, quality and weight to reflect the lack of the public eye. But her version of casual t-shirt and jeans were a beautiful kimono, black linen trousers, and other elegant clothing made from silks, linens and cottons as opposed to wools and crepe and fur which she wore in London. How did you go about making someone who was such a fashion icon your own? You kind of fill yourself up with as much research as possible and then you kind of have to throw it out and see what’s cinematically appropriate for the film you’re filming, that kept me focussed on the task at hand. If I think about how things are going to be perceived and the outcome, then I’d never come out of bed in the morning! If I focus on being true to who these people were and create a language for myself that I understand, then I can move forward in a much more confident and directive way and that’s the best way I can describe how to deal with the overwhelming task of recreating an icon like Edward or Wallis.